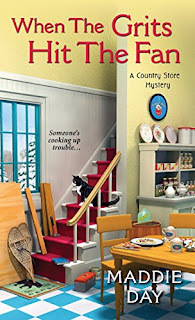 In the Country Store Mysteries, I decided to make my protagonist Robbie Jordan a carpenter as well as a chef. Before the series starts, her mom in Santa Barbara, California dies suddenly of an aneurysm. Robbie’s single mom was a cabinetmaker and had taught Robbie the basics of carpentry. So when Robbie buys the run-down country store in southern Indiana (where her mom was from), she does most of the renovations herself to transform the downstairs into her breakfast and lunch restaurant, Pans ‘N Pancakes. But she has plans to develop the unused second floor into a few bed and breakfast rooms, and she’s doing just that in book three, When the Grits Hit the Fan. It’s winter, the restaurant business is a bit quiet, and she has time to tear out walls upstairs. I know a little bit about the renovation process, having lived in a construction zone for the past ten years! That’s what my partner Hugh does – buys antique New England houses and remakes them into insulated beautiful homes with new wiring, plumbing, and walls but retaining the charm of their trim and floors. When we combined households in 2007, he was just starting the renovation process on his house in Ipswich, Massachusetts. The front part was built in 1718, and the back sections, which had more than doubled the space, were added sometime in the 1800s. He found amazing things in the walls, including historic bottles, old coins, and newspapers. I learned to make sure he sealed off rooms where plaster dust was flying around, and visited other antique homes in the area with him. Once that house was finished, we realized it was too much space for us. Neither of my sons was living with us any more, and we were paying a lot for the place. So we sold our lovely First Period home, and found a smaller house a few towns north in Amesbury. It seemed so modern to us – built in 1890! But it needed the same kind of gutting and rebuilding as the first house. Now, almost five years later, it is finally finished except for a stair runner, which we can’t quite seem to decide on. But Hugh also found things in the walls here, including a pair of pink baby moccasins and one high-heeled black shoe that looked like it was from the thirties or forties. He also found the carpenter’s signature and date on the back of a piece of window trim. 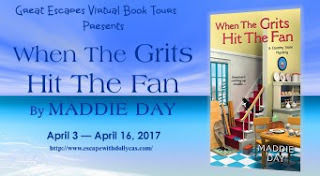 As I was writing When the Grits Hit the Fan, I knew the history of Robbie’s building would play into the story. Those baby shoes and the stylish black lady’s footwear just flowed onto the page as I understood their back story and how it would play into the mystery. But it’s when Robbie finds not only a secret passageway but an old diary that the book really gets interesting! I hope you enjoy the read. Love the cover and the title. Looking forward to reading the series. Thanks Angela for hosting this give-a-way! Loved your review. I've read the first two in this series & enjoyed them both. I loved the first book in this series. I'll have to read the second book quickly and get caught up!